Our friends at the Peachpit User Group Program are making a special offer for all Mac User Groups who are interested delivering both great information on video production and a great price on a Peachpit book to their members. Peachpit would like to give your group a unique opportunity to provide your members with high-quality articles and video instruction from Richard Harrington and Robbie Carman‘s critically acclaimed Peachpit book, Video Made on a Mac: Production and Postproduction using Apple Final Cut Studio and Adobe Creative Suite absolutely free. There isn’t one. All they ask is that you post one article and one video to your Web site every month for 6 months. That’s right, 6 months of FREE content! 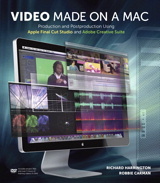 These excellent, high-caliber articles and videos will show your members how to create professional video on the Mac using real-world examples in Final Cut Studio and Adobe Creative Suite. Just include the required permissions language for using the material, a thumbnail cover for the book, and provide a link to purchase on Peachpit.com and away you go. To make it even cooler, they’ll throw in a coupon code just for your members so they can get a great discount on the book should they choose to purchase. Not only that, they will send you 2 free copies of the book — one for you to become familiar with the material, and the other for you to raffle for your members! User group leaders interested in this offer should email Product Manager Damon Hampson (damon.hampson at peachpit.com) who will walk you through the very simple sign-up process. Thanks to Peachpit for another terrific MUG offer.